We actually dug into our own wines the other night…it’s been a while and trust me, with my club shipments back on for the season, it’s been piling up like there’s no tomorrow. All of our wine racks are totally full, as well as at least 9 styrofoam shipper bottoms and a good 4 cases I haven’t even opened yet. If you’re following along, that would be about 400 bottles. Yikes, it would take us over 2 years to drink that many bottles! 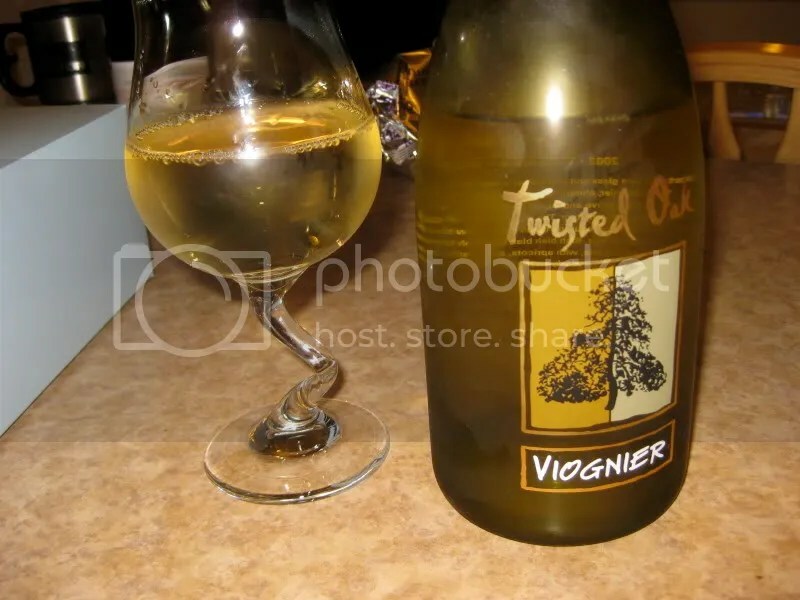 So we pulled out the 2008 Twisted Oak Viognier that came in a recent club shipment. With the club discount it cost $17.60, had a real cork closure, and clocked in at 14.1% alcohol by volume. I paired this with some homemade chicken soup which I think is actually a match I’ve made before, though I’m having trouble finding the post! On the nose I found pear, pineapple, tropical notes, spice, banana, and cream. In the mouth I got pear, peach, tropical notes, pineapple, banana, and spice. The nose and palate tracked pretty well and the wine had excellent acidity. Perhaps a good mate for upcoming holiday dinners? Though really, I’m still not sure anything goes well with sweet potatoes topped with marshmallows! I must confess. With being sick and out of wine commission for a week+ I lost track of days. Then we had company and traveled a few times for family events and all sense of when the next Wine Blogging Wednesday was set for escaped me. Our host this month is Katie over at Gonzo Gastronomy. She tasked us with marrying our bottles of wine with music…though she encouraged no Michael Buble. 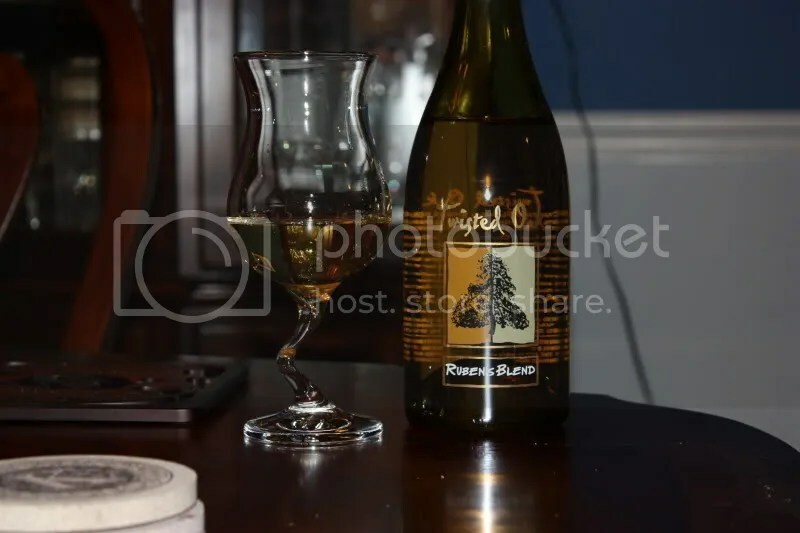 Katie really wanted us to sit with our wine and try it with several different kinds of music, noting how our interaction and experience changed as we alternated the music. You can check out all the details here. Now, I have nothing against music, and very clearly nothing against wine. But what I do have is a clear lack of time. I do most of my weekly blog prep on Sundays. We simply get home too late for me to really have time to compose a coherent (give me a little leeway here, I like to pretend I’m coherent…) wine blog post. Really, it’s either eat or write…I have my priorities in order here…at times. Most of my music listening happens in the car to and from work (drinking wine completely discouraged) or running on the Mall…I think drinking on federal land in public might also be highly discouraged, or illegal. So Monday evening was really the first non-sick, non-traveling day I have had since the latest WBW theme appeared on May 22. That said, I didn’t have time to listen to multiple albums and record my thoughts on the wine as I listened to music across the spectrum. Last week I was tweeting with Silene’s Cellar and Stoc about Tori Amos. Now, I haven’t heard her new record, but I’ve always dug her classic stuff and probably saw her 4 or 5 times live back in the day. She stuck in my mind, and I loaded her Little Earthquakes album onto the top of my play list and rocked out like it was 1992 and I was still an angst ridden teenager (ok, joking here, I was never really a typical teenager…I preferred Billy Joel to the Back Street Boys and other assorted things that put me out of the “normal” realm). It’s sometimes dark, sometimes playful, and almost always makes me smile…which I think explains my relationship with wine fairly well too. Wine can be serious, it can be easy, it can be thought provoking…but overall, it’s fun and it puts a big ol’ grin on my face. When an old skool Tori Amos track comes up on my iPod…I sing along. Out loud. On the streets…or while I’m running on the Mall. It makes me happy and I feel like dancing. 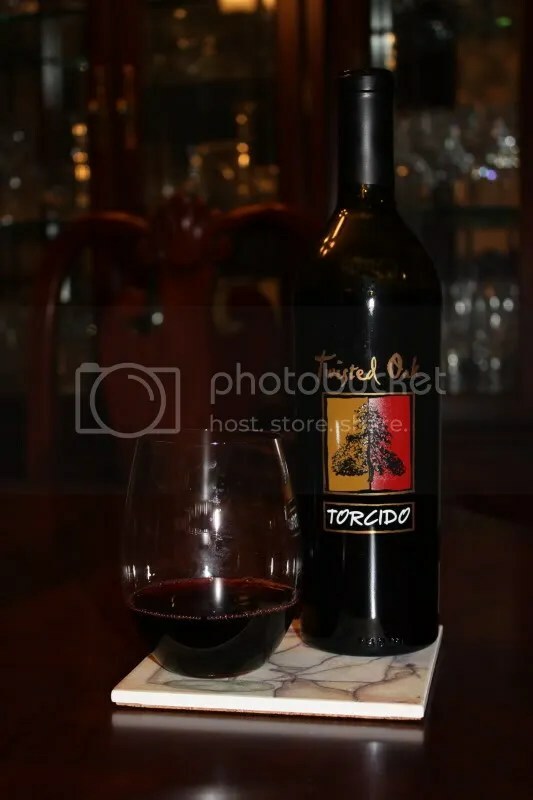 I remember good times with my best childhood friends with Tori….with wine, I remember great times with my friends from my adult years and with my husband. They parallel well to me. 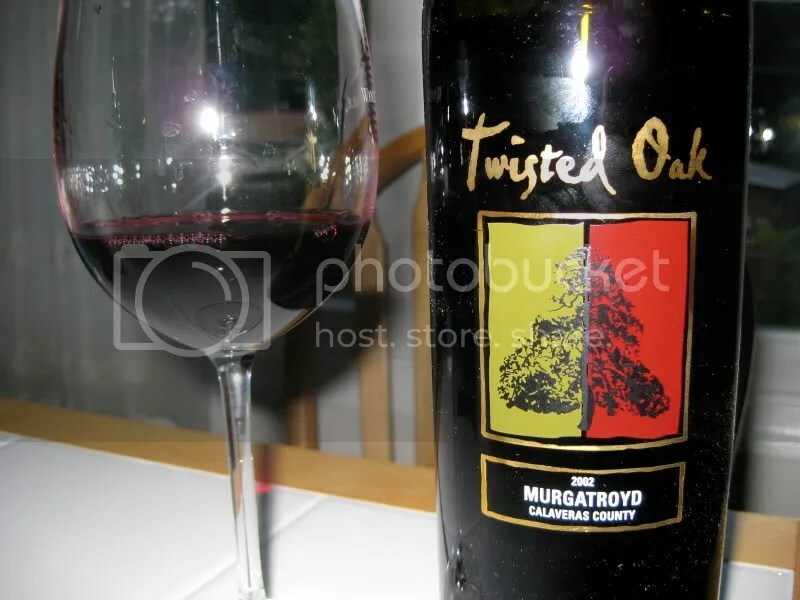 The 2002 Twisted Oak Murgatroyd had a real cork closure…I purchased it from the winery…I want to say it ran me around $20 a bottle, but I can’t remember and I didn’t write it down. The neck had a TON of sediment in it…I’d recommend a quick decant just to rid the bottle of that. Really, I was flabbergasted by what had collected in the neck! On the nose I found spice, mulberry, toasty oak, cinnamon, blackberries, black currants, slight chocolate, and violets. It smelled like mulled cider and tasted like Christmas. In the mouth I got tart fruit that seemed much more red than the nose. 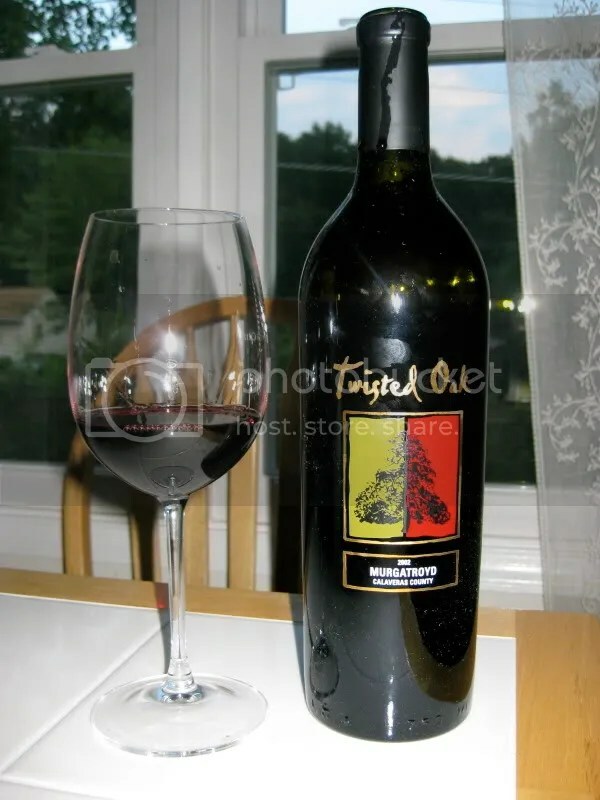 Red berries, red currants, earthy spice, mulberry, cranberry, cinnamon, and spice. 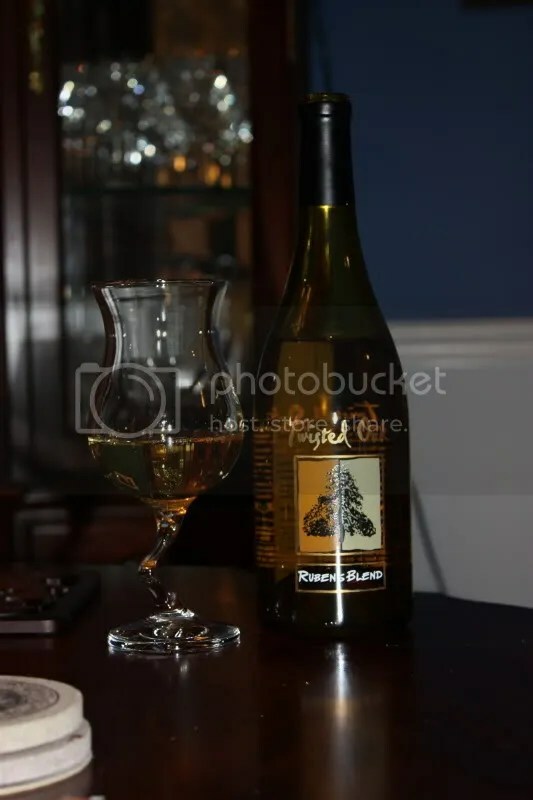 This is ready to drink….I say drink up now…I have 4 more bottles and I think they’ll be best within the year…the wine is smooth, integrated, and the fruit is showing really well. I’m not sure I captured the essence of this theme…but I tried my best, and stepped out of my element…I don’t usually listen to music intentionally or intently while sipping on my wine. So this gave me a chance to sit back and relax…well, as much as I could given getting home after a long freaking day! Many thanks to Katie for hosting and per usual, a tip of my virtual cap to Lenn of Lenndevours, our fearless leader. 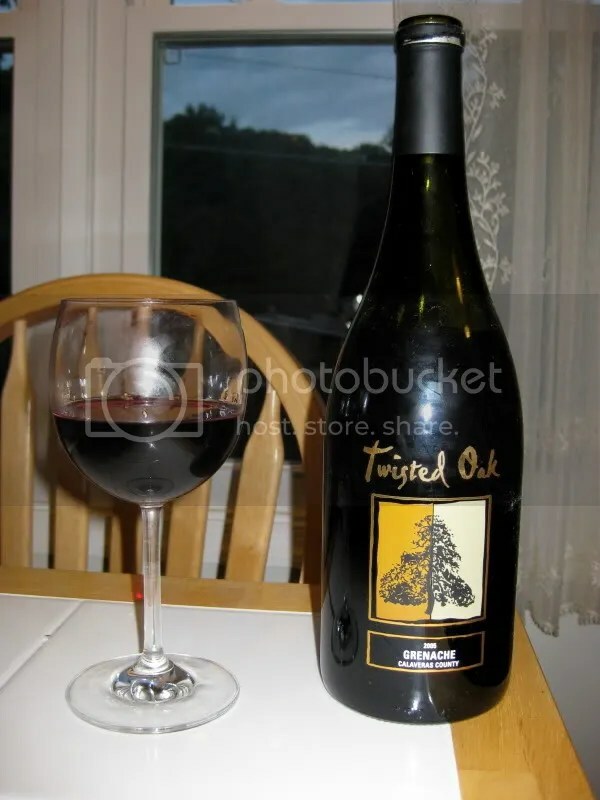 Not too long ago, as a Twisted Few member, I received an email advertising a 50% sale on Twisted Oak’s 2005 Grenache. Being that I love wine, Twisted Oak, and Grenache, it seemed a no-brainer. A case arrived on my doorstep a week or so later, adding to the bazillion bottles of wine already in my basement, but at only $12.50 a bottle, making a most excellent mid-week bottle. 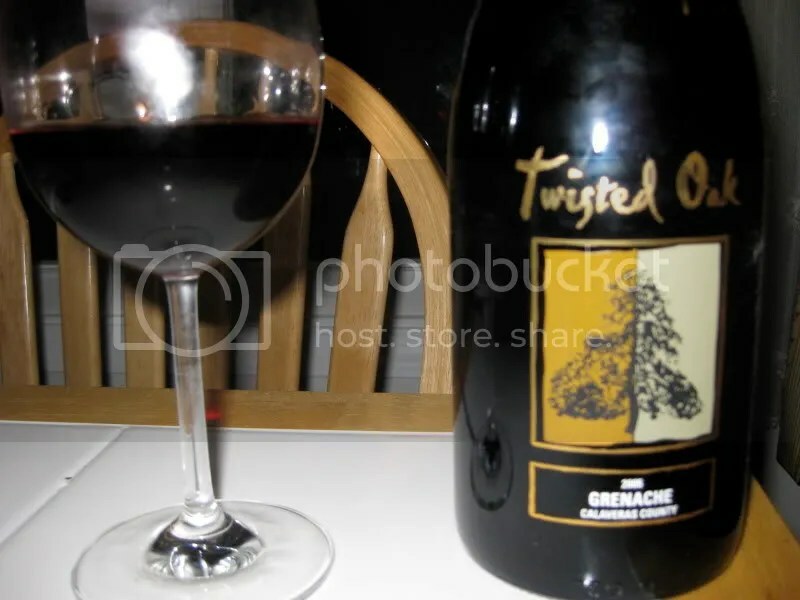 I picked the 2005 Twisted Oak Grenache to pair with my mom’s homemade sauce and meatballs which she brought with her when my folks visited last week. Since dad received some Twisted Oak for Christmas this year, I thought it would be good if he could taste some of mine to compare! The Grenache cost me $12.50 on sale, had a real cork closure, and clocked in at 14.4% alcohol by volume. On the nose I found chocolate dessert, drizzled with raspberry sauce, and followed by a savory herb component. Really, I got chocolate, raspberry, strawberry, herbs, red currants, flowers, and just really bright red fruit all around. In the mouth I found flavors of red berries, raspberries, red cherries, milk chocolate, really bright red fruit, and just a lovely taste of a silky milk chocolate bar. Yes, I realize I said milk chocolate twice, but that flavor kept coming, both up front, and on the finish. My final note on this wine? I’m so happy I have a case (minus one) left to drink! *Disclaimer: I received the wine from Chile from the PR folks for Wines of Chile. That’s right folks, it’s time again for the monthly wine blog world phenomenon Wine Blogging Wednesday. This month, our host is Remy of Wine Case and he tasked us with a battle of the ages: North vs. South. Remy left us to our own devices in interpreting what this meant….would it be a wine from NY vs. a wine from Va or a wine from Canada vs. a wine from CA? Who knows, anything goes! The folks from Wines of Chile recently sent me some white wines from Chile. I’d been hearing great things of the Viogniers coming out of Chile, so I thought I’d use one of those in my epic battle. 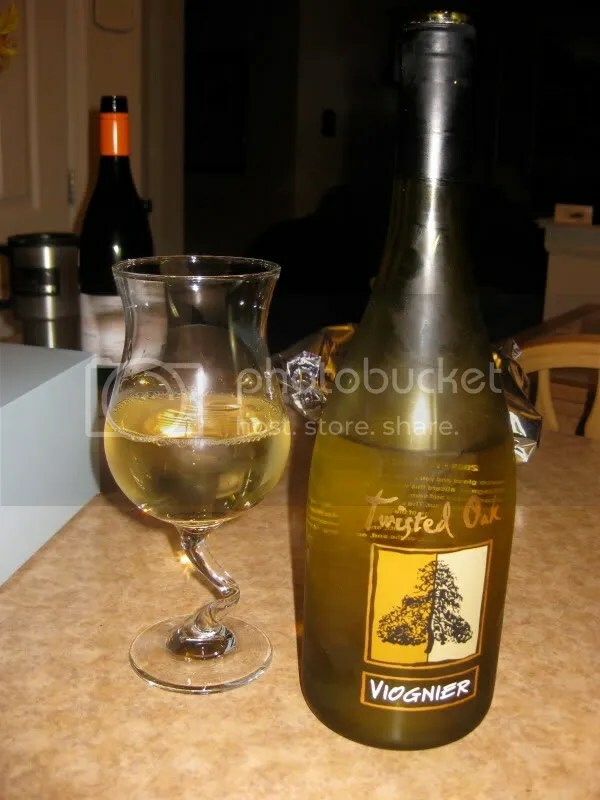 We all know I love Viognier, so I always have some kicking around my basement, so this WBW proved an easy task for me. 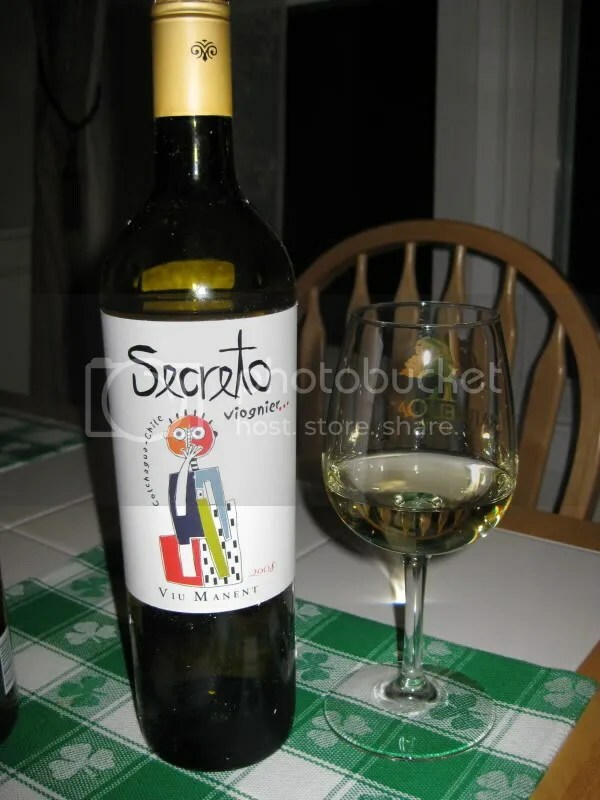 In the end, I decided to pit the 2008 Viu Manent Secreto Viognier vs. the 2007 Twisted Oak Viognier. I’m going to tell you about each wine and then try to outline how they differed. This wine hails from the Colchagua Valley, clocked in at 14.5% alcohol by volume, had a screw cap closure, and appears to retail for somewhere around $10. On the nose I found peach, honey, spice, apricot, biscuits, and something oddly toasty. In the mouth I got flavors of peach, pineapple, and tropical notes. 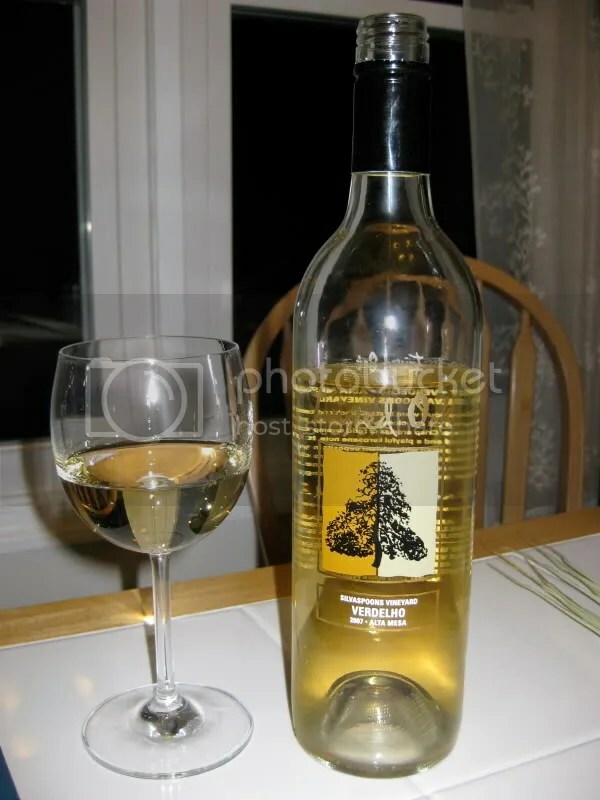 I found the wine to be crisp and light with nice acidity. 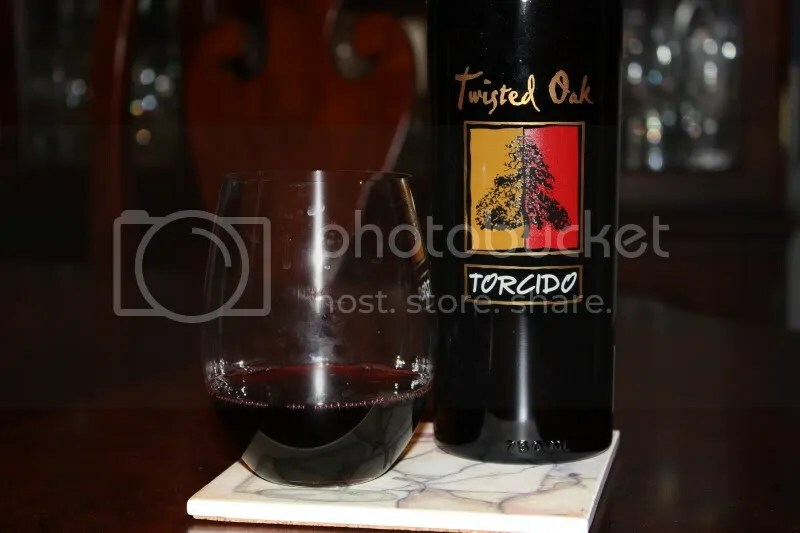 The Twisted Oak comes to us from Calaveras County, CA, clocks in at 14.2%, has a real cork closure, and cost me $17.60 in a club shipment. On the nose I found butterscotch, candied apricots, peach, caramel, yellow apple, and flowers. The nose struck me as very perfumey, like walking in a flower garden. In the mouth I got flavors of spice, apricot, peach, and orange notes. I found the finish to be incredibly long and the wine showed as viscous in the mouth. So the outcome? Two votes for the Twisted Oak in the battle of North vs. South. The Twisted Oak showed as fulled bodied and viscous versus the Secreto which seemed lean and crisp. I found the Secreto to display more tropical aromas and flavors while the Twisted Oak showed stone fruits and apricot, plus the lovely floral aromas. I know the Twisted Oak saw time in oak, but I’m not sure about the Secreto, though it had some toast notes on the nose. So perhaps it saw some neutral oak? 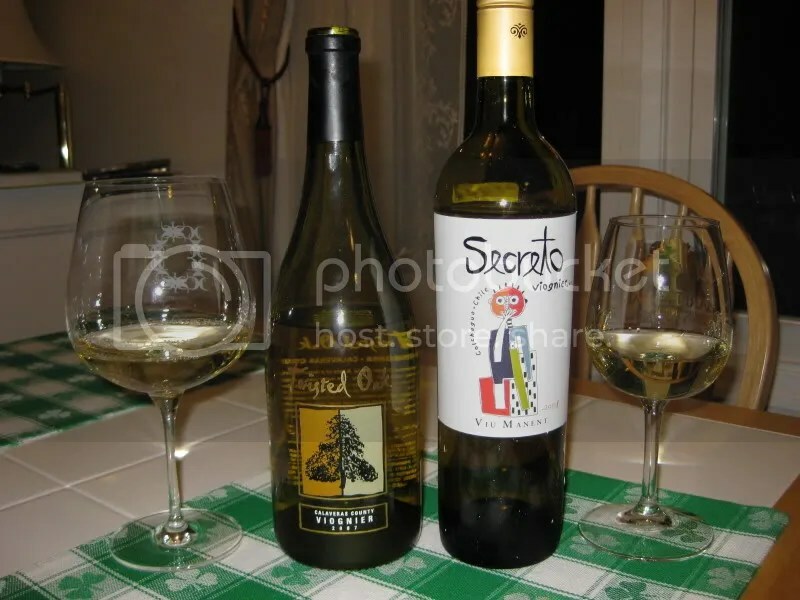 The styles of the two wines couldn’t have differed more with the Twisted Oak being creamy and mouth filling while the Secreto came through as acidic and crisp. 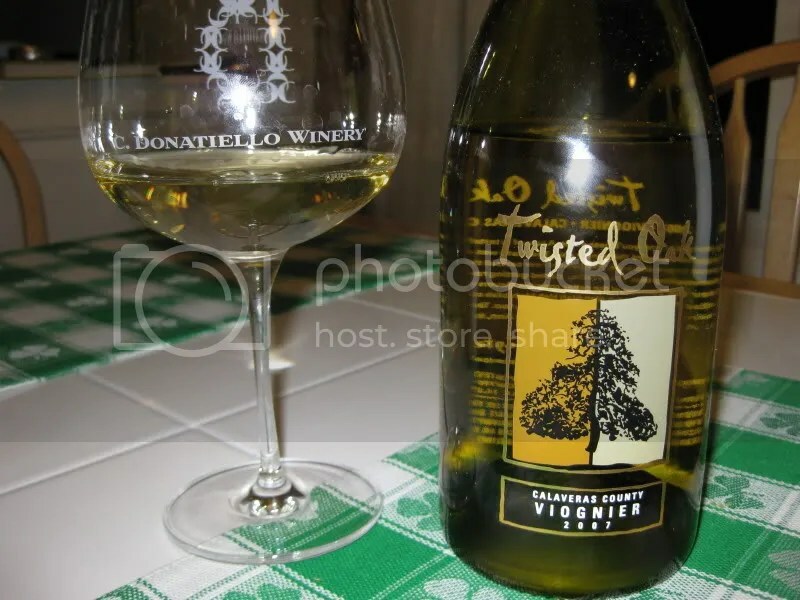 I would drink either of these wines again, but the more complex Twisted Oak Viognier interested me more and we drank through that bottle completely first as we both kept going back for more. An interesting experiment. I wish I had a Virginia Viognier in my basement that I could have thrown into the mix. 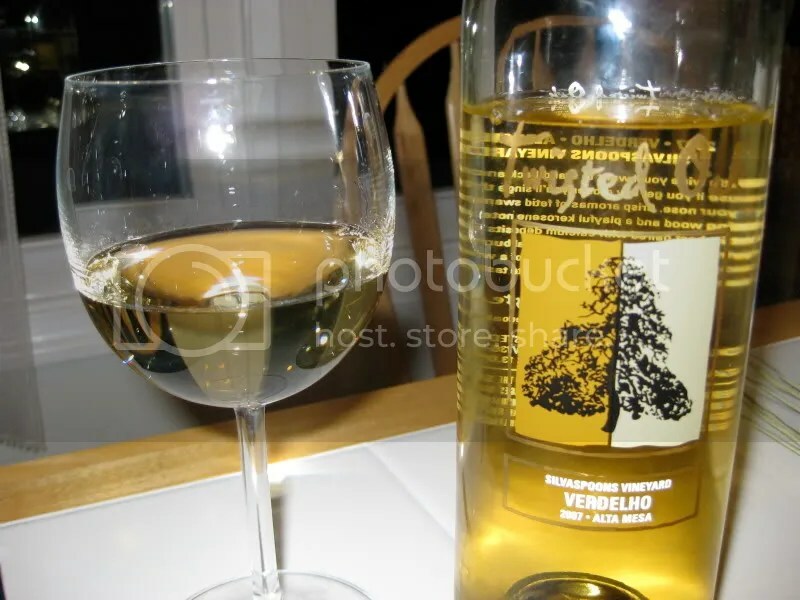 I do look forward to trying the rest of the Chilean Viognier I have around, as I did really enjoy the Secreto as well! Many thanks to Remy for the interesting topic! I look forward to reading everyone’s interpretations of the theme. As always, a virtual tip of the hat to our founder Lenn.